Four years ago this week, President Barack Obama signed the Matthew Shepard and James Byrd, Jr. Hate Crimes Prevention Act of 2009, or Shepard-Byrd Act, into law, saying that the bill was meant to “help protect our citizens from violence based on what they look like, who they love, how they pray.” This measure expanded federal law to include bias-motivated hate crimes based on a victim’s actual or perceived gender, sexual orientation, gender identity, or disability. Despite these legal protections, however, LGBT people—particularly black transgender women and gender-nonconforming gay men—are victimized, persecuted, and murdered at alarming rates. While other bias-motivated hate crimes are generally decreasing in frequency, crimes against LGBT people remain steady. Moreover, existing hate-crime statistics show that LGBT people of color are more likely to experience violence than their white LGBT counterparts. This uptick in incidents could be the result of increased reporting, suggesting that the Shepard-Byrd Act is working as intended and that people feel comfortable enough to report crimes because they have legal recourse. Yet the apparent vulnerability of LGBT people of color to this type of violence—relative to their white peers—suggests that additional work is needed to understand and prevent hate crimes against this community. This is why it is vital to turn a critical eye to examining public policy and law enforcement responses to violence against LGBT people, with particular attention to empirical data and jurisdictional responses. The Shepard-Byrd Act was named in honor of Matthew Shepard, a gay man, and James Byrd, Jr., a black man, both of whom were viciously murdered 15 years ago. These murders brought national and international attention to the lack of bias-motivated hate-crime legislation at the state and federal levels and helped generate a call to action about the murder and victimization of LGBT people across the United States. The Shepard-Byrd Act also benefits the LGBT community in at least three ways. It enumerates protections for LGBT people in federal law; authorizes the Department of Justice, or DOJ, to provide grants to state and local law enforcement to cover expenses related to the investigations of bias-motivated hate crimes; and provides grants for local programs to train law enforcement officials to investigate, prosecute, and prevent hate crimes. The Shepard-Byrd Act also allows federal officials to investigate hate-crime cases that local agencies decline to pursue, a crucial provision given inconsistent state and local laws. Its passage also initiated new federal data-collection practices. Until the passage of the Shepard-Byrd Act, the Federal Bureau of Investigation, or FBI, was not required to research and collect data about hate crimes that targeted people based on gender identity and expression. Although crimes against the transgender community have been occurring for years, keeping an accurate count of bias-motivated hate crimes has been exceedingly difficult. Data collection on the incidence of hate crimes perpetrated against a person due to their gender identity began this year. Despite the importance of the Shepard-Byrd Act, violence continues against LGBT people. 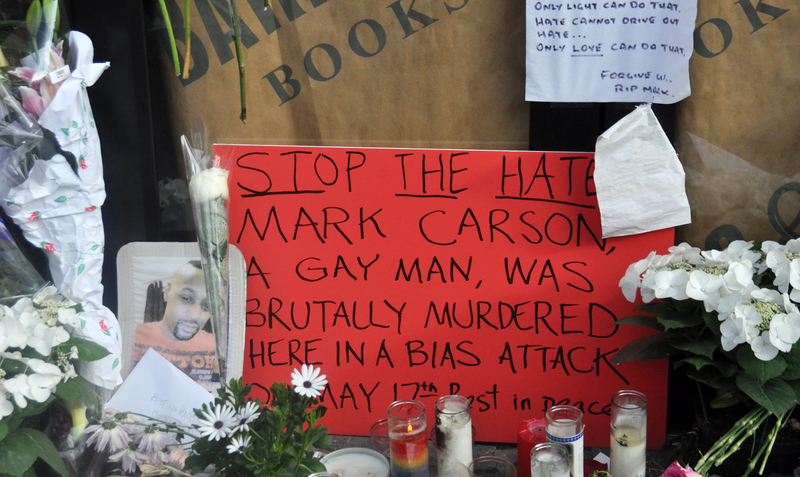 In May, for example, Mark Carson was murdered in Greenwich Village simply for identifying as gay. In New York City, an area generally considered to be a safe haven for the LGBT community, there were a total of seven anti-gay attacks in that same month. In August, Islan Nettles, a 21-year-old black woman, was brutally murdered after identifying as transgender. These are only a few examples of disturbing national trends. LGBT people of color were 1.8 times more likely to encounter hate-motivated violence than white LGBT people. Transgender women were two to three times more likely to experience physical violence, police violence, and discrimination than victims who were not transgender women. Gay men were three times more likely to report incidents of hate violence to the police and 1.6 times more likely to require medical attention than victims who were not gay. As this single piece of legislation will not be able to stem the tide of crimes perpetrated against LGBT people, continuing policy and law enforcement initiatives must equip local and state police officers to meet the unique needs and experiences of LGBT people. According to the NCAVP, LGBT people reported substantial police misconduct when actually reporting hate crimes to local law enforcement. In light of increasing hate-crime allegations from the LGBT community, jurisdictions have responded in myriad ways, many of which are unsatisfactory. Since most crimes are not federal offenses, states play a critical role in providing protections for vulnerable groups. Currently, only 15 states and Washington, D.C., have laws that address hate or bias crimes based on sexual orientation and gender identity. In addition, 15 states have laws that specifically mention hate or bias crimes based solely on sexual orientation. Lastly, 14 states have laws that address hate crimes but fail to list sexual orientation or gender identity as protected categories. This patchwork of state laws leaves many LGBT people in a precarious situation, especially in circumstances where federal agencies do not elect to investigate bias-motivated hate-crime allegations. Fortunately, some jurisdictions have responded effectively to hate-crime allegations. According to the Phoenix, Arizona, local police department, for example, police liaisons work directly with LGBT-community advocacy groups, resulting in better enforcement of laws. Despite increasing rates of hate-crime allegations, these relationships may contribute to LGBT people feeling more comfortable with reporting crimes and may be a model for other jurisdictions. Not all jurisdictions, however, are willing to help LGBT individuals who are victims of hate crimes. Since last spring, there have been at least six reported bias-motivated hate crimes against LGBT people in Cleveland, Ohio. The latest incident involved a gay man who was attacked when exiting Cleveland’s Cocktail Lounge, a local gay bar. Instead of assisting the victim, however, the City of Cleveland issued a letter to the bar owner stating that “the bar’s repeated calls to law enforcement are over-burdening ‘the taxpayers of the City of Cleveland’ and ‘our safety forces.’” The city then asked the bar owner to respond with a plan to reduce calls for service. This jurisdictional reaction to bias-motivated hate crimes is problematic. The letter served as a warning to hate-crime victims to not call the police for assistance and suggested that money was more important than protecting the lives of Cleveland residents. Certainly, all jurisdictions have not effectively responded to bias-motivated hate-crime allegations even after the Shepard-Byrd Act, but increased attention to these issues could save the lives of many LGBT people. Because of the Shepard-Byrd Act, for example, local agencies can now request a provision of grants from the DOJ to combat bias-motivated hate crimes. Anecdotal data, such as the experiences of the Phoenix Police Department, suggest that bringing the law enforcement and LGBT communities together can have a positive effect on addressing violence at the local level. The passage of the Shepard-Byrd Act was a watershed moment for the LGBT community. Although violence against LGBT people persists, the Shepard-Byrd Act brought more attention to violence against LGBT individuals and created federal protections for the transgender community. Strengthening the Shepard-Byrd Act by ensuring sufficient training of local, state, and federal law enforcement officials who work with LGBT communities would go a long way toward identifying bias-motivated hate crimes and investigating and prosecuting perpetrators of these violent acts. Preston Mitchum is a Policy Analyst with the FIRE Initiative at the Center for American Progress, which works to eliminate the social, economic, and health disparities faced by LGBT people of color. He would like to thank Laura E. Durso and Stephanie Adams for their valuable input to this column. Throughout this column, the author uses hate-crime statistics from the most recent NCAVP report describing how hate-motivated crimes affect the LGBT community. See National Coalition of Anti-Violence Programs, “Lesbian, Gay, Bisexual, Transgender, Queer, and HIV-Affected Hate Violence in 2012” (2013), available at http://www.avp.org/storage/documents/ncavp_2012_hvreport_final.pdf.